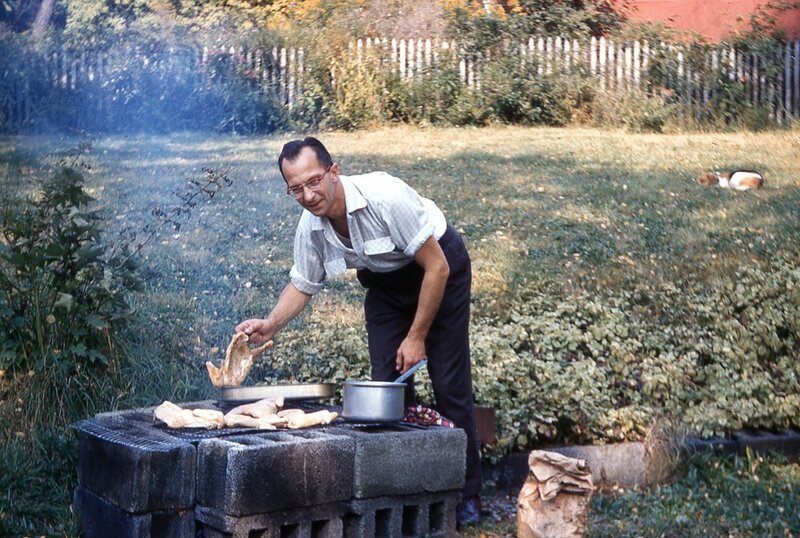 I never tire of 1950s Kodachrome photo slides. This week's set of images is no exception. These men appear to be enjoying a late summer swigs of beer and oyster slurps. It was in a set of about 100 Kodachrome slides that appeared to be from about 1950-1955. The slides were documenting at least a few different, but related vacations. Many of the same people were in the photos. Here are some of the other images in the set. This photo slide was noted as "6/18/50" and seemed earlier the the others that were more mid 1950s (or labeled as such). Was this the same event as the previous photo? There was only one photo in this set that gave any indication of a location. The following photo slide was labeled: "Devil's Bathtub Mend Park Oct - 1956". I am fairly certain this was taken at the Mendon Ponds Park outside of Rochester, New York. The colorful foliage fits with the autumnal October notation. So, though this last photo came from the same set, it is almost certainly from a different trip. With some more careful analysis I could probably piece together a more detailed timeline and history of these photos. For now though, I am content with simply appreciating their beautifully vibrant colors. You'll see gorgeous Kodachrome photo slides throughout previous Pic of the Week and other blog posts. Check out some of the posts below. A mystery reel of 1980s undeveloped home movie film is found in my parent’s basement. The contents are revealed here! I recently discovered that our family’s 1970s Kodak XL360 Movie Camera still had a reel of used but undeveloped Super 8 film it it! Here is what I did with it and what I hope to find. Here's a delightful, smile inducing, Kodachrome photo slide of a toddler enjoying a 1950s summer. Take a look! Two real men sitting with two fake woman in "Ghost Town Calif." The girl does not seem too pleased. Here are some charming Kodachrome photo slides of a smiling older couple from the mid 1950s. They came from a lot of about 100 slides on eBay. They appeared to be of several different, possibly related, families. Notes on some indicated East coast locales like Vermont and New York. Here 6 tips for dating, scanning, cleaning, organizing, saving, and sharing your family Kodachrome and other photo slides. These are treasured images too often lost. It may be up to you to save them. A beautiful 1956 Kodachrome photograph slide of a Central City, Colorado street scene in 1956. A beautiful color Kodachrome photo slide image of a fisherman from the early to mid 1950s.